These very low tides occur twice per month, but usually occur at night or during a weekday. So these negative tide events on weekends during daylight provide rare opportunities to see TONS of critters that are rarely visible. Mussels, sea stars, eels, clams, crabs crabs crabs, and tons of other critters become trapped in the tide pools for a few hours. You name it, you'll see it! 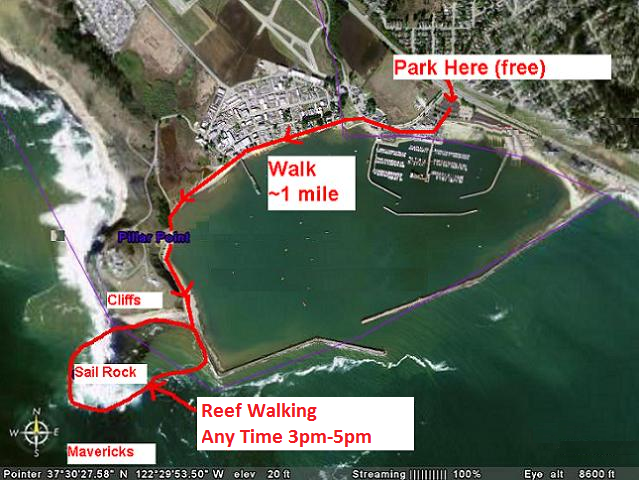 Park in Pillar Point Lot C. Start walking toward the reef under the satelite dishes next to the HMB airport. It's about a 1 mile walk, give or take. Come and go as you please, this is a public park so everything is open to the public. No charge for anything. These are NOT guided tours, so you are on your own, though several naturalists usually show up to answer questions. 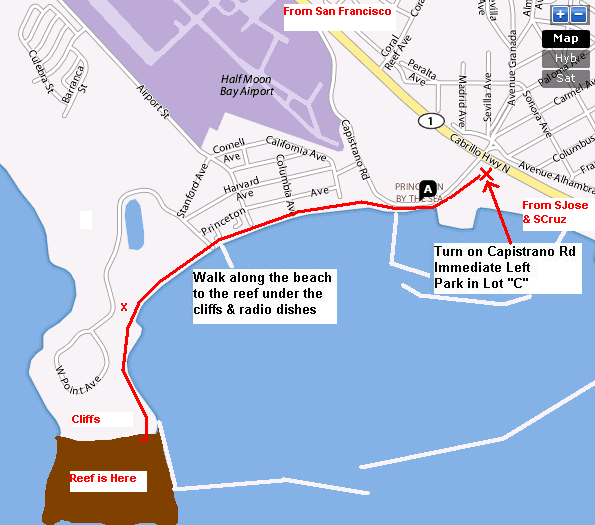 Go north on Highway 1, turn left at the fourth traffic light onto Capistrano Dr. Take the next left into the Pillar Point Harbor and park in parking lot C, on your left. Go south on Highway 280. Take Highway 1 south to Pacifica. Drive past Pacifica and over Devil's Slide. At the first traffic light after Devil's Slide, turn right on Capistrano Dr. Take the next left into the Pillar Point Harbor and park in parking lot C, on your left. Park in Lot C across from the white tents at Half Moon Bay Kayak.